PASADENA, Calif.-- With the sun now shining down over the north pole of Saturn's moon Titan, a little luck with the weather, and trajectories that put the spacecraft into optimal viewing positions, NASA's Cassini spacecraft has obtained new pictures of the liquid methane and ethane seas and lakes that reside near Titan's north pole. The images reveal new clues about how the lakes formed and about Titan's Earth-like "hydrologic" cycle, which involves hydrocarbons rather than water. The vast hydrocarbon seas and lakes (dark shapes) near the north pole of Saturn's moon Titan sprawl out beneath the watchful eye of NASA's Cassini spacecraft. Scientists are studying images like these for clues about how Titan's hydrocarbon lakes formed. Titan is the only world other than Earth that is known to have stable bodies of liquid on its surface. The largest of the dark shapes, at the upper right, is Kraken Mare, Titan's largest sea and about the size of the Caspian Sea and Lake Superior put together. To its left lies Ligeia Mare (about 300 miles or 500 kilometers across), the second largest sea. Punga Mare (about 240 miles or 380 kilometers across) is below Ligeia Mare and just above its leftmost finger is the north pole. Titan's Northern Lakes: Salt Flats? This false-color mosaic, made from infrared data collected by NASA's Cassini spacecraft, reveals the differences in the composition of surface materials around hydrocarbon lakes at Titan, Saturn's largest moon. Titan is the only other place in the solar system that we know has stable liquid on its surface, though its lakes are made of liquid ethane and methane rather than liquid water. 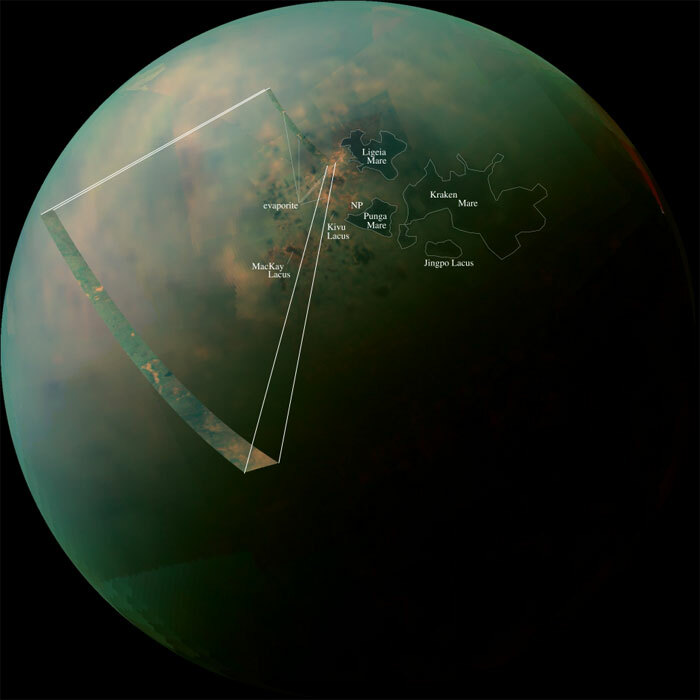 While there is one large lake and a few smaller ones near Titan's south pole, almost all of Titan's lakes appear near the moon's north pole. Scientists mapped near-infrared colors onto the visible color spectrum. Red in this image was assigned a wavelength of 5 microns (10 times longer than visible light), green 2.0 microns (four times longer than visible light), and blue 1.3 microns (2.6 times longer than visible light). The orange areas are thought to be evaporite -- the Titan equivalent of salt flats on Earth. The evaporated material is thought to be organic chemicals originally from Titan's haze particles that once dissolved in liquid methane. They appear orange in this image against the greenish backdrop of Titan's typical bedrock of water ice. In this mosaic, Kraken Mare, which is Titan's largest sea and covers about the same area as Earth's Caspian Sea and Lake Superior combined, can be seen spreading out with many tendrils on the upper right,. The big dark zone up and left of Kraken is Ligeia Mare, the second largest sea. 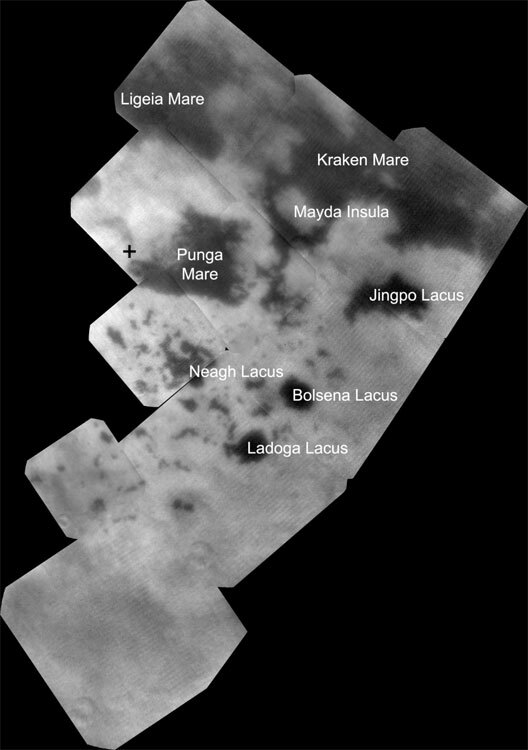 Below Ligeia, shaped similar to a sports fan's foam finger that points just up from left, is Punga Mare, the third largest Titan Sea. Numerous other smaller lakes dot the area. 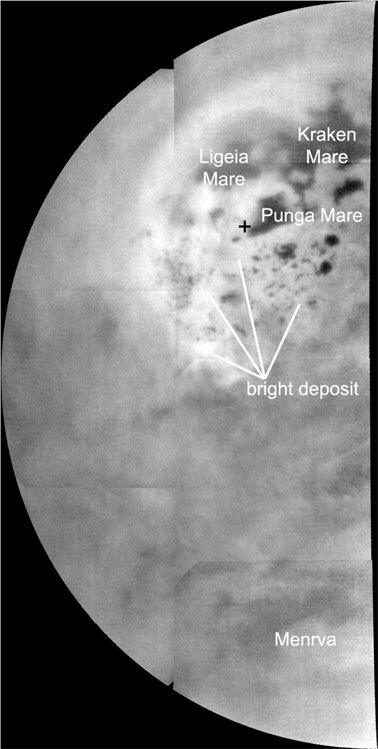 Titan's north pole is located in the geographic location just above the end of the "finger" of Punga Mare. Ultracold hydrocarbon lakes and seas (dark shapes) near the north pole of Saturn's moon Titan can be seen embedded in some kind of bright surface material in this infrared mosaic from NASA's Cassini mission. 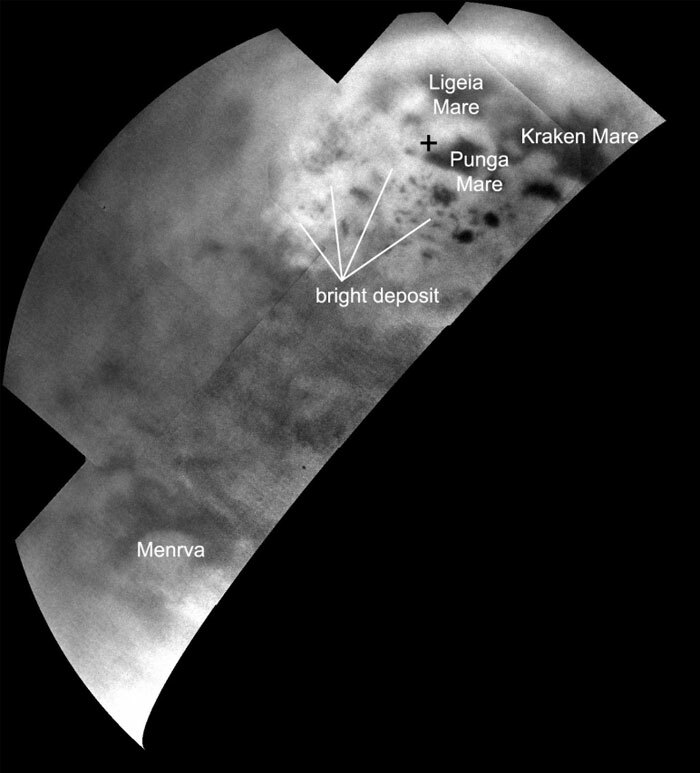 The bright area suggests that the surface here is different from the rest of Titan, which might help explain why almost all of the lakes are found in this region. Titan's lakes have very distinctive shapes -- rounded cookie-cutter silhouettes and steep sides -- and a variety of formation mechanisms have been proposed. The explanations range from the collapse of land after a volcanic eruption to karst terrain, where liquids dissolve soluble bedrock. Karst terrains on Earth can create spectacular topography such as the Carlsbad Caverns in New Mexico. Titan is the only world in the solar system other than Earth that is known to have stable bodies of liquid on the surface. Titan's, however, are composed of liquid ethane and methane rather than liquid water. While there is one large lake and a few smaller ones near Titan's south pole, almost all of Titan's lakes appear near the moon's north pole. Scientists are using images like these to understand why. The north pole is at the upper right in this view, marked with a cross. The largest of the dark shapes, at the upper right, is Kraken Mare, which is about the same size as Earth's Caspian Sea and Lake Superior put together. To its upper left lies Ligeia Mare, the second largest sea (about 300 miles, or 500 kilometers, across). Directly below Ligeia Mare, Punga Mare (about 240 miles, or 380 kilometers, across) lies near the north pole. Almost all of the hydrocarbon seas and lakes on the surface of Saturn's moon Titan cluster around the north pole, as can be seen in this mosaic from NASA's Cassini mission. This mosaic, made from near-infrared images of Titan obtained by Cassini's imaging science subsystem, shows a view from the north pole (upper middle of mosaic) down to near the equator at the bottom. Here, the seas and lakes appear as dark shapes, embedded in some kind of bright terrain. Titan is the only world in the solar system other than Earth that is known to have stable bodies of liquid on the surface. Titan's, however, are composed of liquid ethane and methane rather than liquid water. The bright area suggests the surface material around the lakes is unique and might explain why almost all of Titan's lakes are found in this region. It appears to cover much of the surface north of 65 to 70 degrees north latitude on this side of Titan. Titan's lakes have very distinctive shapes -- rounded cookie-cutter silhouettes and steep sides - and a variety of formation mechanisms have been proposed. The explanations range from the collapse of land after a volcanic eruption to karst terrain, where liquids dissolve soluble bedrock. Karst terrains on Earth can create spectacular topography such as the Carlsbad Caverns in New Mexico. The north pole is in the upper middle in this view. The largest of the dark shapes, at the upper right, is Kraken Mare, which is about the size of the Caspian Sea and Lake Superior put together. To its left lies Ligeia Mare, the second largest sea, which measures about 300 miles (500 kilometers) across. And below them is Punga Mare, which lies near the north pole and is about 240 miles (380 kilometers) across. While there is one large lake and a few smaller ones near Titan's south pole, almost all of Titan's lakes appear near the moon's north pole. Cassini scientists have been able to study much of the terrain with radar, which can penetrate beneath Titan's clouds and thick haze. And until now, Cassini's visual and infrared mapping spectrometer and imaging science subsystem had only been able to capture distant, oblique or partial views of this area. Several factors combined recently to give these instruments great observing opportunities. Two recent flybys provided better viewing geometry. Sunlight has begun to pierce the winter darkness that shrouded Titan's north pole at Cassini's arrival in the Saturn system nine years ago. A thick cap of haze that once hung over the north pole has also dissipated as northern summer approaches. And Titan's beautiful, nearly cloudless, rain-free weather continued during Cassini's flybys this past summer. The images are mosaics in infrared light based on data obtained during flybys of Titan on July 10, July 26, and Sept. 12, 2013. The colorized mosaic from the visual and infrared mapping spectrometer, which maps infrared colors onto the visible-color spectrum, reveals differences in the composition of material around the lakes. The data suggest parts of Titan's lakes and seas may have evaporated and left behind the Titan equivalent of Earth's salt flats. Only at Titan, the evaporated material is thought to be organic chemicals originally from Titan's haze particles that once dissolved in liquid methane. They appear orange in this image against the greenish backdrop of Titan's typical bedrock of water ice. "The view from Cassini's visual and infrared mapping spectrometer gives us a holistic view of an area that we'd only seen in bits and pieces before and at a lower resolution," said Jason Barnes, a participating scientist for the instrument at the University of Idaho, Moscow. "It turns out that Titan's north pole is even more interesting than we thought, with a complex interplay of liquids in lakes and seas and deposits left from the evaporation of past lakes and seas." The near-infrared images from Cassini's imaging cameras show a bright unit of terrain in the northern land of lakes that had not previously been visible in the data. The bright area suggests that the surface here is unique from the rest of Titan, which might explain why almost all of the lakes are found in this region. Titan's lakes have very distinctive shapes -- rounded cookie-cutter silhouettes and steep sides -- and a variety of formation mechanisms have been proposed. The explanations range from the collapse of land after a volcanic eruption to karst terrain, where liquids dissolve soluble bedrock. Karst terrains on Earth can create spectacular topography such as the Carlsbad Caverns in New Mexico. "Ever since the lakes and seas were discovered, we've been wondering why they're concentrated at high northern latitudes," said Elizabeth (Zibi) Turtle, a Cassini imaging team associate based at the Johns Hopkins Applied Physics Laboratory, Laurel, Md. "So, seeing that there's something special about the surface in this region is a big clue to help narrow down the possible explanations." Launched in 1997, Cassini has been exploring the Saturn system since 2004. 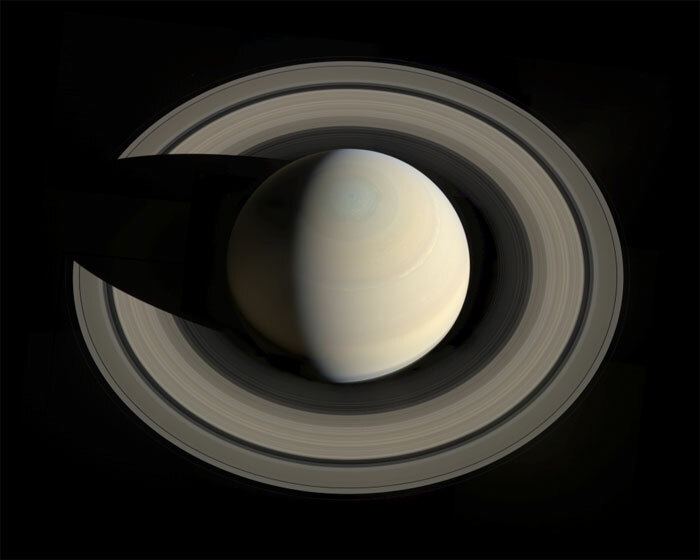 A full Saturn year is 30 years, and Cassini has been able to observe nearly a third of a Saturn year. In that time, Saturn and its moons have seen the seasons change from northern winter to northern summer. "Titan's northern lakes region is one of the most Earth-like and intriguing in the solar system," said Linda Spilker, Cassini project scientist, based at NASA's Jet Propulsion Laboratory, Pasadena, Calif. "We know lakes here change with the seasons, and Cassini's long mission at Saturn gives us the opportunity to watch the seasons change at Titan, too. Now that the sun is shining in the north and we have these wonderful views, we can begin to compare the different data sets and tease out what Titan's lakes are doing near the north pole." The Cassini-Huygens mission is a cooperative project of NASA, the European Space Agency and the Italian Space Agency. JPL manages the mission for NASA's Science Mission Directorate, Washington. The California Institute of Technology in Pasadena manages JPL for NASA. The VIMS team is based at the University of Arizona in Tucson. The imaging operations center is based at the Space Science Institute in Boulder, Colo.